Norvell provides an immediate beautiful bronze tan that not only looks good, but is formulated with a skin firming blend that builds and restores the skin’s matrix. It is this proprietary blend that reduces the appearance of fine lines and wrinkles for skin that feels good, and looks great. Norvell solutions are 100% vegan, paraben & gluten free and maintain your skin's natural pH levels to ensure a healthy, non-orange spray tan. 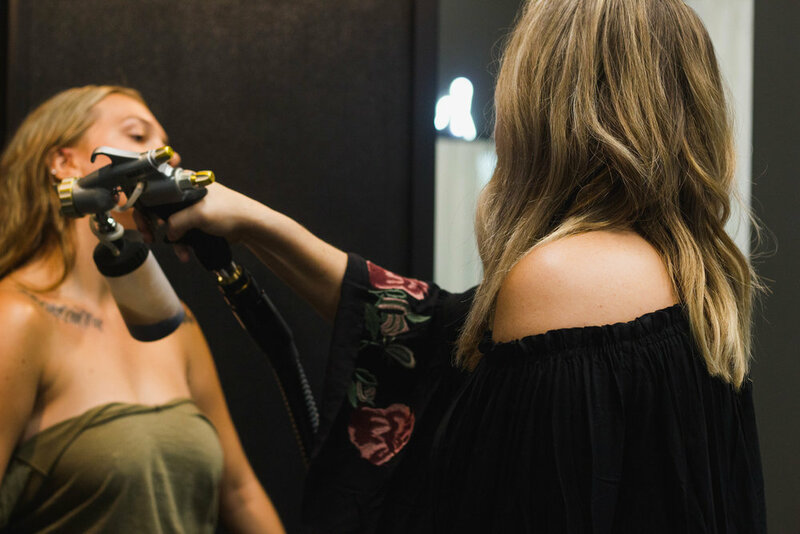 Our spray tans are applied using a handheld applicator to ensure maximum skin coverage (unlike spray tan booths). A custom designed sunless tanning solution that produces an express, quick-drying, natural, long-lasting, “just off the beach” tan! Radiant supple bronzed skin is only one spray away! After 8-12 hours rinse off in a warm shower. An exotic sunless formula with a unique combination of violet and brown tone bronzers, designed to mimic the sought-after skin tones found on the beautiful beaches of the European Riviera. ONE utilizes a proprietary amino acid propulsion system, xLa-R8R, to boost rapid tan development. This enhanced compound prepares the skin while infiltrating its out walls resulting in instant colour gratification. After 1-3 hours rinse off in a warm shower - 1 hour for a bronze color, 2 hours for a medium bronze color, and 3 hours for a dark bronze color. Extending the duration longer than 3-hours is NOT recommended for optimum results.